Send an encrypted e-mail. Its content can only be seen by yourself and the intended recipient. 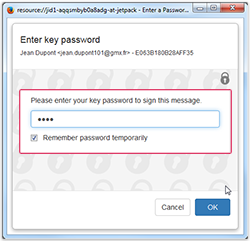 To write an encrypted e-mail, you will need the recipient's public key. To do so, you can invite him to Encrypted Communication, or add him by hand. See Inviting Contacts. In your inbox, click the lock icon next to the compose e-mail button. You will see the usual Compose E-mail with your custom mailvelope background. Add one or more recipients. You can add recipients set up for encrypted communication, marked with the grey lock icon. Compose your e-mail as usual. Feel free to add attachments up to 10 MB. If asked, enter your passphrase and confirm with OK. Your e-mail is being sent. You can view it in your Sent folder on any device set up with your key pair.